This guide is a starting point for research in securities law, covering U.S. federal, U.S. state, international, and foreign securities law. 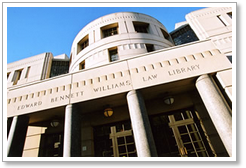 This guide is intended as a starting point for research in securities law at the Georgetown Law Library. It includes both primary and secondary materials, in both print and electronic formats. It covers U.S. federal, U.S. state, international, and foreign securities law. This is the definitive treatise for securities, and provides in-depth analysis of all aspects of securities law. It is more scholarly than the Federal Securities Law Reporter and is heavily footnoted with cases, law review articles, and SEC issuances. The SEC's web site is well-organized and contains up-to-date information relating to all aspects of the regulation of securities. This resource, available in print and online, is the source most often used by practitioners for researching securities laws. Organized by act section, it brings together the full text of statutes, regulations, selected SEC releases, case annotations, commentary, and analysis and offers many useful finding tools. Bloomberg has brought together BNA's well-respected expertise in securities, extensive searchable databases of SEC materials (including EDGAR filings), and practical treatises published by PLI.